500 years ago the Japanese started bringing live trees inside their homes. Today we beautify our surroundings with miniature trees made of gems. Using a variety of base material and a carefully selected variety of gems, these trees are thought by many to have healing qualities or enhance different areas of your life. Citrine is used for wealth, jade for health, rose quartz for love, orange and yellow carnelian for ambition, drive, and emotional warmth, and for healing – the mysterious power of black obsidian. The beauty of these miniature trees is limited only by the artist’s imagination. 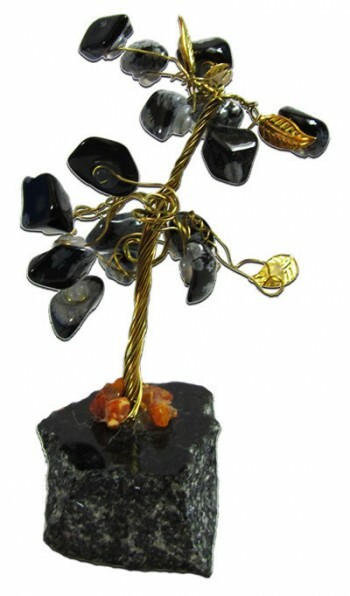 The base of the tree can be anything from a vase to a piece of marble, quartz, crystal or wood, the trunk and limbs are normally copper wire, and the gem leaves are an unlimited array of beauty.